Caption: "What's your superpower?" Lourds Lane of the SuperYou FUNdation inspires students at the Capital Region Institute for Human Rights Teen Symposium at NYSUT headquarters in Latham. Photo by Liza Frenette. 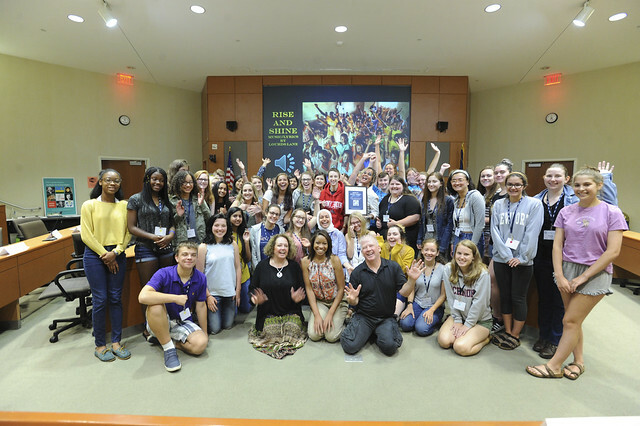 Fifty high school students representing 13 school districts were given a homework assignment on the first day of the Capital Region Institute for Human Rights. They had to ponder what their superhero trait was and create a superhero name for themselves. Lourds Lane, a former rock star, playwright and creator of the non-profit education program SuperYou FUNdation and curriculum, gave them the assignment as part of her work teaching students to find confidence and be empowered by it. The students and teachers in the institute, being held this week at NYSUT headquarters in Latham, came up with names reflecting their passion to tend to the hurts and needs of people, and places needing advocates. At the institute, they were presented with panels, speakers and workshops to connect them with causes and missions to which they can contribute. Lane appeared as “Shine,” a superhero in a glossy cape, and her superpower is love. “It’s just about being kind to your fellow humans,” she told students as she hopped on a table and raised her arm in a show of empowerment. On the back of her cape is a yellow sun. The sun, she said, is endlessly sourced and omnipresent. It is reliable. Lane encouraged students to “embrace your inner misfit … if you can’t fix it, just feature it.” She shared with them her struggles growing up with an abusive father and a mother who pushed her hard. Eva Hymes of Shaker High School in Albany County showed up in a cape as “Radical Recycler.” She stood in the center of the room and claimed perseverance as her superpower. Her mission is to help the earth through recycling. “Beam” is the newly anointed superhero name for Julianna Pollicino, who just graduated from Shaker High and is attending the institute for the second time. Her superpower is amiability. Lane talked about the importance of digging deep to connect with human rights. “It’s about putting energy into this world,” she said. Martin Luther King, Lane said, walked six million miles and gave 2,500 speeches in his human rights work. Her education mantra is “I love you, I believe in you and you and I can change the world.” People can lift the spirits of others by showing up, by giving children hope, by finding their own highest selves and by reaching out to others. “How you see people is how they are going to show up,” she explained. Sixth-grade Bethlehem teacher Bill Reilly, a co-director of the Institute for Human Rights, donned a cape, head bandana and a colorful t-shirt with the peace sign to appear as “Peaceteacher.” He is speaking to students during the three-day program about global issues, and his own work as a board member of World Window, which provides education initiatives in the U.S. and abroad. Reilly, a member of the Bethlehem Central Teachers Association, is coordinator of the Global Coalition for Peace Education and Cultural Awareness, an Internet project connecting schools and students around the world. The founders of the three-year-old Capital Region Institute for Human Rights are educators Thea MacFawn, a teacher, and Kelly Wetherbee, a librarian and media specialist, both members of the North Colonie Teachers Association. MacFawn took a rare pause, smiled, thought and then picked “Heart” as her superhero name; her trait is nurturing others. Retiree Ann Fantauzzi of Saratoga Springs schools chose “Supercare” as her new superhero name. She’s been to Africa seven times with the organization the Giving Circle, where she works on education. At schools built by the Giving Circle, education is provided to both students and teachers. A handful of students there once attended a termite-ridden building. Now, there is a new building and 500 students. Teachers are trained in sign language to help them teach the many, many deaf students, as well as other students, so the schools become bilingual. The deaf students have particularly tough lives, and school is a haven unto itself. Other speakers at the institute included Professor David Crane, chief prosecutor of the Special Court for Sierra Leone, an international war crimes tribunal; Harold Eisenstein, a NYSUT lawyer who is a child of Holocaust survivors; and Rory Gerberg, who spoke about gender-based violence and women’s rights. Projects such as Worlds Windows, Super FUNdation, I Am Syria, I AM HUMAN, and the Giving Circle are just some of the programs that students are learning about during the institute. They are being encouraged to contribute to human rights through their voices, their art, video making, theater, volunteering and many other ways. “It takes bravery. It takes courage,” said Jim Bell, English teacher and member of the North Colonie TA who volunteers each year at the institute to help students learn how to engage constructively and advocate for their cause even when people disagree with them. As the parent of a daughter with a disability, Bell is an advocate every day. Zoe Thomas, a Bethlehem ninth-grader, heard about the program on the announcements at school. She is interested in learning more about LGBQT rights and how to be supportive. “I want to become better educated and to help out,” she said. American-born, Ahmed’s parents are from Bangladesh, and she said people have called them terrorists. “It kind of got me mad,” she said.